The Camden Leather Armchair is a bestselling design with a classic twist. Upholstered in high quality leather, the piece adds warmth and character to a space and is part of the popular Camden Collection. Like every leather product, the Camden features one of a kind markings that accentuate the natural quality of leather. Pure leather is a premium natural product, meaning it will display normal characteristics such as colour variations, marks, scratches and scuffs. 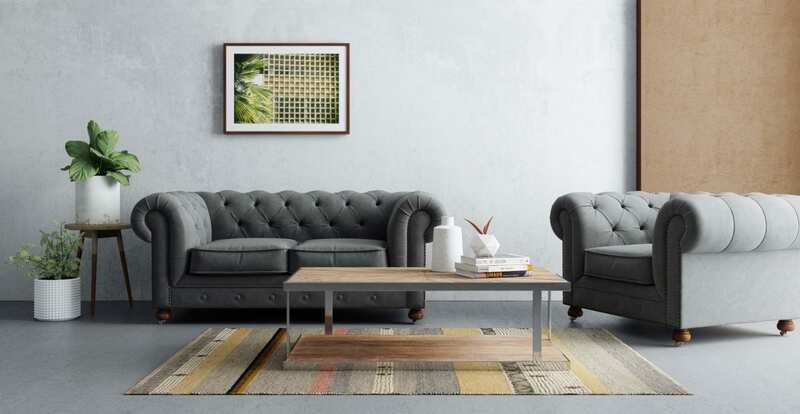 Incredibly inviting, the Camden has a dense foam filling and curved back and arm rests, which make for a comfortable and embracing sit. The buttery soft leather has been meticulously flattened, sanded and softened for a high quality consistency that only improves with age. Brass studding and expert tufting lend a look of sophisticated elegance to the Camden, while a wax and oil finishing protects and enhances the quality and colour of the piece. See more stunning armchair options from Brosa. The armchair comes available in three organic shades that are made more unique with high and low lights throughout. The piece is easy to maintain, with a simple wipe down from a clean cloth keeping it looking fresh. See, touch and feel our fabrics used on our Camden Chesterfield Leather Armchair. For Free! Simply select up to 3 fabrics and add them to your cart. Delivery is on us.